On November 2009 Deloitte released a report called Energy Security – America’s Best Defense; A study of increasing dependence on fossil fuels in wartime, and its contribution to ever higher casualty rates, by General Charles F. Wald (USAF Ret) and Tom Captain (Deloitte Vice Chair). There are too many mistakes, wrong statements and errors in the report but I will focus on its main “findings” which are equally misleading and unjustified,… Based on those “findings”, Reuters run a news piece on 10 November 2009 entitled “Pentagon could save lives by cutting fuel use-study.” One of the three subtitles was: Casualties in Afghan war could more than double. Well, well. How did they come to those conclusions? “using a least squares regression forecasting methodology”! Put 2017 in place of X in that equation, you will get 22.95. Put 2027 and you will get 26.04. This trend fitting to 5 points takes maximum 5 minutes in Excel, if you are slow. If you select polynomial curve you could even get an R2 more than 0.97. And it does not mean anything. I will comment on this methodology more below. On Page 18, the authors “correlate the number of total US causalities in Afghanistan –killed in action and wounded- from 2002 through the present, to the increasing consumption of fuel by US forces. This demonstrates that the number of convoys required to transport an ever increasing requirement for fossil fuels is itself a root cause of causalities, both wounded and killed in action.” NO WAY! Now, even worse is the following. “The Deloitte study found that absent game-changing shifts, the current Afghan conflict may result in a 124% (17.5% annually) increase in U.S. casualties through 2014, should the war be prosecuted with a similar profile to Operation Iraqi Freedom.” (p. 1) See also page 28 to understand how they came up with that conclusion. 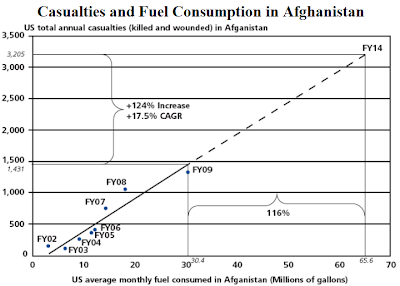 This equation means that US total causalities in Afghanistan (Y) is a linear function of average monthly fuel consumed in Afghanistan by US forces (X). You have 8 points. Again, it takes maximum 5 minutes to produce that chart and equation. The more you consume fuel the more causality you get. BUT if you do not consume at all (zero consumption, X=0), then causality would be -105. For instance, if you use this kind of logic and do a similar exercise for Iraq you will have increasing causalities through 2017 and further even though the Status of Forces Agreement signed by the governments of Iraq and the US in Nov 2008 states that all US troops would be withdrawn from Iraq by December 31, 2011. Lesson: be aware of negative intercept (constant) in econometrics equations. I may not be a military expert but I (used to be) an expert on econometrics professionally. Why fuel consumption would increase the total number of soldiers killed and wounded in Afghanistan. There are many more important factors than fuel that affect the increase in causalities. A serious analysis indeed would look into relationship between fuel consumption and causality rate due to convoy protection. If you are looking for a serious report on the causalities related to fuel use in Afghanistan, then you must read carefully the Final Technical Report of the Army Environmental Policy Institute called Sustain the Mission Project: Casualty Factors for Fuel and Water Resupply Convoys, dated 17 September 2009. This 13 page report is to me at least 10 times more informative and valuable than the Deloitte study. The study develops a methodology for calculating casualty factors for fuel (and water) resupply convoys in theater operations in Iraq and Afghanistan. Casualties calculated include Army soldiers and civilians killed or wounded while transporting fuel to consuming units and forward operating bases in theater. Casualty factor for fuel resupply in Afghanistan is 0.042; that is 0.042 casualties for every fuel-related resupply convoy or nearly one casualty for every 24 fuel resupply convoys in Afghanistan. The report’s origin goes back to General Zilmer’s request that Department of Defense measure the cost of fuel in blood, not dollars. It first tries to determine the proportion of resupply casualties related to fuel resupply. They estimate that an average annual load allocation for convoys in theater (for OIF and OEF) is about: 50% fuel; 20% water; and 30% other in terms of volume for FY2008. The average number of fuel-related casualties per convoy is calculated by dividing the fuel related resupply casualties by the total number of fuel-related convoys. 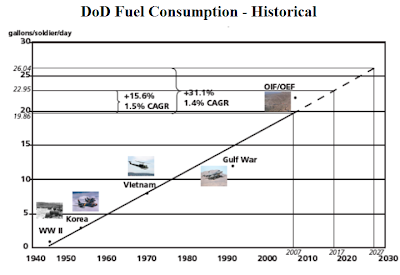 In fact it would have been a much better metric if they had used causality factor per amount of fuel consumed. They would find that each 55,702 barrel fuel burned in Afghanistan by the US military forces corresponded one causality. The report goes beyond casualty factors (human costs of resupplying Army units with fuel and drinking water in theaters of operation). Energy and water technologies (as well as increased use of energy efficiency, renewable energy and on-site water production in theaters of operations) can substantively reduce the need for resupply convoys in theater; and therefore potentially reduce casualties without sacrificing operational effectiveness. The report calculates that a 10 percent reduction in fuel consumption by 20 SBCT equivalents over a five year period could lead to a reduction of 35 fuel-related resupply casualties. (A weak point of the report is the assumed linear relationship as implied on page 9, as well as constant capacity of fuel trucks but this not so important here). This brings me a recent GAO Report on MRAP. It says that “As of July 2008, about 75 percent of casualties in combat operations in Iraq and Afghanistan were attributed to improvised explosive devices. To mitigate the threat from these weapons, the DOD initiated the Mine Resistant Ambush Protected (MRAP) program in February 2007, which used a tailored acquisition approach to rapidly acquire and field the vehicles.” As of July 2009, about $22.7 billion has been appropriated for the procurement of 16,204 MRAP vehicles, and 13,848 vehicles fielded in two theaters of operation. Total MRAP production funding was about $22.7 billion, mostly through supplemental appropriations. Hate to nit pick but your R-values do not show a tight fit. You have made no analysis of residuals, so you aren't able to determine variance or confidence. It is a neat idea, but needs to be vetted with statistical accuracy. That's exactly the issue I want to raise. The equations are not mine. They belong to Deloitte study. What I wanted to say is that R2 does not mean anything. What they did could not even be called econometrics.